Shuffle and deal 7 cards to each player. Place the deck in the center and flip 4 cards face up forming a cross of playable stacks. Players must draw a card at the beginning of each turn. If the player cannot play they must keep drawing until they can. First player to play all their cards wins. Play cards on the stacks in descending order, alternating black and red, like solitaire. Each player plays until they have no more moves then knocks. Stacks can be moved to other stacks. Ex: A stack with a red 9, black 8, and red 7 can be moved to a black 10. When this happens an empty slot is created that the player can fill with any card. Kings are played on the corners going out from the deck in diagonals. If a player has a King they must place it in one of the corners, creating a new playable stack. Kings must remain on the corners. 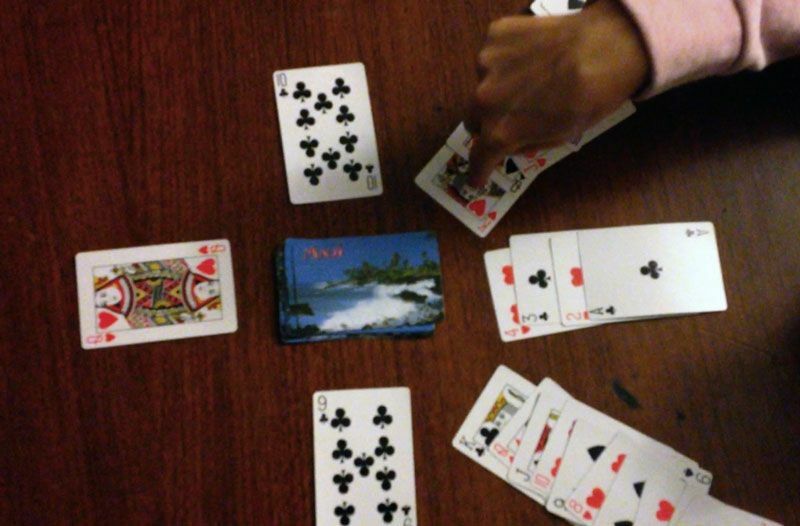 When a stack is complete, Ace through King, it is collapsed and flipped upside down. If the center deck runs out shuffle the collapsed stacks and replace it.